LETHERHEAD WAR HOSPITAL SUPPLY WORK-ROOMS, FETCHAM GROVE. The Penny Collecting Cards brought in over £70. The money will provide materials for dressing-gowns, shirts, bandages, surgical dressings, etc., all of which are urgently needed. The work-rooms re-open on Tuesday, Jan. 8th. The Magazine is at last free from the incubus which has oppressed it for something like a score of years; and starts afresh with this number entirely free from debt. This happy result has been brought about by the energies of the ladies of the recently formed Parish Magazine Committee, and the generosity of the Parishioners to whom they appealed for help. I am inexpressibly grateful to them all for their relief from the burden of a very great anxiety. It now remains for us of the Committee to carry on the publication of the Magazine with a stricter attention to economy, and for the Parish as a whole, if it desires that the publication should be continued, to give it considerably increased support. There is a very great number of households who do not take it in regularly, and who could without difficulty afford the 1/- a year—far below cost price—at which it is issued to those who really cannot pay more: many of which yet protest from time to time if certain items of information chance to have been omitted from it. That indicates that the existence of the Magazine is valued in the Parish by people who do not realise that its existence really requires their support. The printers’ charges for the next three months are increased by 20 per cent. I long to say a word to you for the New Year. ‘Happy New Year’ is what we hardly dare say this time: it must be a sad year: it must carry an almost overpowering burden of anxiety and suspense. But can we say something better, ‘a Grand New Year.' It may, if God will, see exploits of defence against oncoming masses, or of bold offensive, as grand at least as those made already by our heroic armies and crowned with success. It may be grand, in spite of dark outlook to-day, with honourable peace. It may be grand in the courage, patience, and faith of our people, if, in the spirit of President Wilson’s noble speech to his Congress, the country wakes to the clear, full, open-eyed understanding that it stands for a mighty cause, with everything at stake to lose or win for ourselves and for the world: and so determines to throw aside the selfishness, and the backwardnesses, and the slacknesses, and the boastful bluster and downhearted grumblings, and to throw itself into one strenuous, concentrated, self-denying effort to carry through. It may be a grand year if the nation ‘finds itself, finds its soul and its faith, strong in reliance not on its own bow or sword, but in the Name of the Lord, and in His Right Hand. (1) Our present task is to fight, and fight through: we took it up with a good conscience: we have carried it on at tremendous cost and sacrifice: to flinch now would not be wisdom or moderation, but weakness. Fighting is an odious task, but, like other things, once taken up it must be done thoroughly. Not brutally, nor vindictively, but just thoroughly, doggedly, bravely, to the end. (2) But doggedness is not to be dullness. Mere fighting month by month deadens and dulls. The fighting of a great nation must be for a great cause, clearly and nobly understood: with open eyes and clear conscience and quick understanding. We must listen for the voices which really uplift and strengthen by reminding us of what is the meaning through it all and beyond it all: the purpose which war is to serve, and peace by God’s blessing is to secure. (4) With such godly fear must go greater keenness to be worthy of the vocation with which Britain and her Empire or Commonwealth of daughter peoples are charged: more zeal to see our common life strenuous, unselfish, fair to all, ‘favourable to’ the poor, clean, pure, and temperate,—as of one that has loins girded for his task. All this means in plain English that 1918 brings to our country the call for a great spiritual effort, or effort of its spirit. Are we capable of it? There is only one way. Spirit only can work upon spirit. That which is born of the flesh is flesh. The Spirit of God must be upon the nation, touching its conscience, kindling its purpose, strengthening its will. The Spirit is of God’s giving, not of our making. But He wills that we should ask: He bids us seek. Here surely is our special task in the Church of Christ. For the Church, if it is not the soul of the Nation, at any rate lives to quicken that soul, to call down God’s blessing into it. So we come to Proclamation Sunday. The Nation through the King calls out to us to pray: to open 1918 with prayer. Let us make no formal reply. I do earnestly entreat all, clergy and people, to make a great effort in this matter, to use the opportunity so that at the end of the day we may feel we have made a real effort in prayer, and that we carry forward a big impulse of steady praying into the coming months. I HAVE been asked to print in this number of the Magazine, the letter of our Bishop to the “Times” of Dec, 26th, 1917, which I read in Church on Sunday, Dec. 30th. I add to it extracts from two other letters from the “Times” of the same date which I also quoted on that morning. Sir,—It is impossible to leave Sir Arthur Conan Doyle’s Christmas letter to you without some notice or reply. I have been in comradeship with Sir Arthur at least once (in the campaign on behalf of the tortured races of the Congo) in a way which left behind a feeling of regard, possibly mutual, certainly on my part sincere. Perhaps, therefore, this and my standing in years may make it better for me than for another “platitudinous Bishop” to write. It is impossible for a Christian nation to have the precepts of Christ flatly challenged without any word of firm remonstrance and repudiation on behalf of those who desire to be His disciples. I can do this best if I say, first, how far I go with Sir Arthur. I too “tremble” with indignation (the word has literal truth) when I hear even at second hand of these monstrous doings by Germans to the English officers who fell into their cruel hands. I too feel that these things ought in due place and measure to be known. The cards of fact ought to be on the table in a crisis so tremendous as this. I was glad when Lord Bryce’s Committee gave us the awful facts of the Belgian invasion in verified shape. I too resent with Sir Arthur the way in which pacifists, or some of them, while they underline every British fault and mistake, shut their eyes to or minimize or doubt the authentic records of the brutality which force-worship, encouraged by thinkers and rulers alike, has led Germans to commit and to justify—or to regard as hardly needing justification. I too desire with him that our people should be nerved in every right way for the appalling strain of effort and patience under bereavement which is needed for going through to the end with a righteous cause; and I should prefer that Christian-minded English gentlemen rather than clerics like myself should decide how far it is necessary to go in diffusing German infamies, and spreading the “tremble” of indignation. But Sir Arthur Conan Doyle goes far beyond this. He is perfectly definite. He recognises no limitations. “The Uses of Hatred” is the title of his letter, and the substance of it agrees. “Hate has its uses in war, as the Germans have long discovered. It steels the mind and sets the resolution as no other emotion can do.” We possess the best “material” for awakening this “strong elemental emotion,” and we neglect our opportunity. To me it seems a wonderful and terrible thing that we should look German conduct in the face, see it for what it is, denounce it as such, and then imitate it, and preach a gospel of imitation. Agreed: with just the limitation that you should not be too confident when you are judge not only of your own case, but of how that case appears to the enemy. But has Sir Arthur never considered the simple moral distinction between hatred of the sin and hatred of the sinner? Christ denounced the Scribes and Pharisees for what they did and taught. There was no lack of hatred for the evil in His words. But it was from those lips that came the precepts : “Love you enemies, do good to them that hate you, pray for them that despite-fully use you”; the precept with which Sir Arthur seems to invite us, under sufficient temptation, finally to part company. In our own day President Wilson has known, if any man has, how to make words scorch and lash. I should be surprised if he descended, from the moral level on which he has kept us, to this endorsement of hate. I pray Sir Arthur to reconsider, and his readers to refuse. To abstain from hatred under such circumstances is perhaps as hard a moral duty as any that can face us. But are we to be told that moral duties only hold good until the temptation to transgress them becomes sufficiently strong? I would add that there is one reason of interest (in the highest sense) why we should follow the way of duty. For if indeed it be true that the moral forces are in the end in God’s world the forces that win, and if we are out against the embodied lie that might can dispense with right, then the harm that will come in the end from inoculating our souls with the hateful poison of hate will even for the purpose of the war bring us weakness rather than strength, while it must infect our body politic for its future course and for struggles on behalf of liberty and of justice (in which Sir Arthur Conan Doyle would, I surely hope, be out for the right) with the weakness of a terrible disease. Farnham Castle, Surrey, Dec. 26. Sir,—Sir A. Conon Doyle’s plea for the publication of German wickedness will miss its mark for lack of a right word. “Hate,” and certainly hate as in Germany, is a treacherous help even to a fighter, like the spur of a dangerous drug, and to the Christian is a thing forbid. But there is the best Christian reason for teaching our people the facts. If vengeance is God’s, judgment is also man’s. Our nation’s spiritual duty is, as Christ commanded, to judge righteous judgment, and having judged to execute. To judge rightly we must know what the criminal did, and why. But hate is the wrong word for the inspiration which the righteous judgment should yield. The right word is anger. Anger can be Divine, as in Jesus, who “looked round with anger.” Britain can be angry and sin not. To be less than this would be the true sin. Christ on the Cross prayed the Father to forgive His enemies. Did the Father forgive, without punishment and repentance? Jerusalem laid even with the ground was part answer to Christ’s prayer. Germany on the ground, with broken sword, must be the beginning of an answer to a Christian's prayer to-day. The Military Cross has been awarded to Lt. Oliver Stanley Webb, of the Royal Engineers. The Military Medal has been awarded to Pte. Ernest Frederick Palmer, 2/7th Bn. King’s Liverpool Regt. (formerly of the 5th Bn. East Surrey Regiment). The following announcement appeared in the “Times” of Dec. 12th, 1917. AN OFFICER’S SACRIFICE OF HIS LIFE. Story of a Noble Deed. “In France on Sept. 3rd, 1916, Lieutenant Leach was examining bombs in a building in which two non-commissioned officers were also at work, when the fuse of one of the bombs ignited. Shouting a warning he made for the door, carrying the bomb pressed close to his body, but on reaching the door he found other men outside, so that he could not throw the bomb away without exposing others to great danger. He continued therefore to press the bomb to his body until it exploded, mortally wounding him. On Sunday, Feb. 17th, the Annual Sermons will be preached in aid of Missions to Seamen, which are doing such splendid work for our Seamen both of the Navy, and Merchant, Transport, and Fishing Services in these days of war. In the Parish Church the preacher, morning and evening, will be the Rev. F. C. Lees, Organizing Secretary to the Missions. THE DAY OF PRAYER AND THANKSGIVING. This day was well observed here. There were larger attendances at the Holy Communion both in the Parish Church and at All Saints’. The morning service at the Parish Church was attended by the 10th Batt. Surrey Volunteers, the V.A.D. orderlies and nurses, and a number of convalescent patients from the Red Cross Hospital, who were all seated together in the body of the church. The first part of the Service was read by the Rev. St. Clare Hill, Chaplain to the Battalion; the Special Litany by the Rev. C. J. Sharp; and the Vicar read out the names of the Letherhead men who had fallen in the war and also prefaced a short address by the King’s Proclamation and a letter from the Bishop of the Diocese. The evening service, which was also conducted by the Vicar, was attended by the members of the Urban Council in their official capacity, by the Church Lads’ Brigade and Boy Scouts. The services at All Saints’ Church, where the Rev. R. B. Maurice officiated, were also of special character. The collections during the day were in aid of the British Red Cross Society and Order of St. John and amounted at the Parish Church to £25 10s. 6d, at All Saints’ to £8 18s. 11d. In the afternoon a united service was held at the Victoria Hall, were there was a crowded attendance. On the platform were the Vicar (Rev, T. F. Hobson), Rev. W. E. Morgan (Congregational Minister), Rev. F. Colwyn Vale (Wesleyan Minister), Rev. Canon Hunter (Rural Dean), Rev. E. A. Downes (Headmaster of St. John’s School), Rev. C. J. Sharp, Rev. H. G. Jameson, and Rev. S. M. Whitwell. The service opened with the singing of the hymn, “O God, our help in ages past,” after which the King’s Proclamation was read by the Vicar, and prayers were said and the 46th Psalm read by the Rev. F. Colwyn Vale. After the hymn “Eternal Father” an excellent address on Prayer was given by the Rev. W. E. Morgan. The names of the Letherhead men who have fallen in the war were read by the Vicar, who also said the closing prayers. After the hymn “O God of Peace” the Vicar pronounced the Benediction, and an impressive service concluded with the singing of the National Anthem. The collection amounted to £4 16s. and after deduction of expenses £2 9s. were sent to the Joint War Committee of the Brit. Red Cross and Order of S. John. Nurse Mckenna, who ever since the outbreak of war has been serving as a Sister in the local Red Cross Hospital, has now returned to her post as District Nurse;—and all calls for her help in cases of illness should be made to her at 2, Burton Villas, Poplar Road, as in previous years. During her absence of over 3 years from the district work, her place has been most excellently taken by Nurse Florence Rodgers—now Mrs. E. R. Watson, —to whom the Committee of the Nursing Association and her many patients offer their most grateful thanks. Lent begins on the 13th of this month. It is, of course, a time for special self-denial in token of sorrow for sin, and for real effort at amendment of life. How shall we best keep it this year? The need of the country, and the circumstances of the time, enforce upon us, whether we are willing or not, definite restrictions in the matter of food: the duty of fasting—the simplest and most obvious form of self-denial and the most practical means of acquiring self-control, of subduing the flesh to the spirit, is no longer a voluntary thing. In spite of that, too many people still find means of evading the fulfilment of that duty. One very real way of “keeping Lent” accordingly lies clear before us. It is to follow the rules laid down for us by the authorities, not grudgingly, just so far as we are absolutely obliged to do so; but cheerfully and with absolute conscientiousness, as a sacrifice of self to the claims of God against Whom we have offended, and for the welfare of our fellow citizens: who suffer increase of privation in proportion as any of us try to shift the burden from our own shoulders. Lent is also the time for special turning to God in prayer, both public and private. Many of us can make more effort at regular joining in public worship, both on Sundays and week-days: on the latter by attending the Services of Intercession and instruction on Wednesday evenings, and can try to make their prayer at home more real and definite. Taking part in public services of intercession is a real help towards this: it aids, if we give our minds to it, in keeping before us particular things about which we can pray to God at all times. And another way to keep this season is to spend a little more time, if it is only half-an-hour a day, in really serious thought about God and how we stand in regard to Him, how far we are following His commandments as to our duty to Him and to our neighbours : to study and think about His Word to us in the Bible; to read books—as far as we have opportunity—which may help us to realise what God requires of us, and how far we fall short of it; and which may open our eyes more fully to the needs of our neighbour, and of our country and empire. And as to Almsgiving. In spite of the increased cost of living this is in some ways made easier for very many of us ; and the way to it is certainly very plainly indicated. In many ways we are unable to spend upon ourselves—the things are not to be had, even if we have the money which would procure them: there is therefore in the hands of many—I know also that it is not in the hands of very many—a good deal of money which need not be, and should not be, spent upon ourselves in new ways. It can be given to God in very various forms for the relief of suffering, for the need of those who are in real want, for the extension of His kingdom at home and abroad: and also for the strengthening of our country’s ability to maintain the cause of His righteousness in the War in which we all are engaged. We shall, I hope, during this month hear a great deal about the War Savings Association in Letherhead, and see a very great extension of its working among us: and where money invested in them means self-denial, means a refraining from spending it upon things which are not absolutely essential to ourselves, means a willing giving of what costs us something for a high and noble object, such application of our money is a true almsgiving—a giving of our substance, because our hearts are touched, to the glory and honour of God. I have before me a post card which again shews the design of entangling persons in this Parish with a “Chain of Prayer.” I trust that any to whom such demands are sent will not take the slightest notice of this most foolish and superstitious appeal. The attempt to deceive people into imagining that something dreadful will happen to them, if they break the chain, and fail to comply with the call to copy a prayer on post cards and send one of these on a number of successive days to a fixed number of people is nothing less than an invention of the devil. It would be difficult to conceive anything further removed from the spirit of true prayer as taught us by our Lord Jesus Christ. The Distinguished Conduct Medal has been awarded to Cpl. (Acting Sergt.) Percy William Wilsden, R.F.A., now serving at Salonica. Pte. Alexander T. Songhurst, Queen’s Royal West Surrey Regt., killed in action, 1917. Pte. Harry Godwin, 1/5th Bedford Regt., killed in action in Palestine, Dec. 1st, 1917. Pte. Lyall ML Neale, 5th Bn., Royal Queen’s West Surrey Regt, died of wounds in Palestine, Dec. 21st, 1917. We greatly regret to record the death of Mrs. Skene at her brother-in-law’s house at Appleton, near Warrington. She had been in very delicate health for some time, but it was hoped that she was on the highway to recovery, when a relapse occurred, and she passed away on Jan. 1st. Mrs. Skene, who had lived for some time at the Little Dene, Kingston Avenue, was married to the Rev. A. P. Skene, then Curate-in-charge of All Saints’ Church, on July 1st, 1914, and gave invaluable aid to her husband’s work as District Visitor and in many other ways. This she continued for half a year after Mr. Skene left us in order to become Chaplain to the Forces at Easter, 1916, until her own departure from Letherhead. Both of them were greatly missed by their many friends in Letherhead, and the deepest sympathy will be felt by all of us for Mr. Skene in his great sorrow. The Rev. A. P. Skene desires to thank all his friends in Letherhead very gratefully for their kindness in his bereavement. The Rev. C. J. Sharp has been placed by the Bishop among the number of those Clergy of the Diocese to whom a summons may be sent at any near date for active service as Chaplain to the Forces at the Front or elsewhere. It is obvious that when he is called away, a re-arrangement, and some diminution, of the services in our Churches and of other Parochial activities will become necessary. EGG COLLECTION FOR WOUNDED SOLDIERS—CHILDREN’S WEEK. The number of eggs collected by the children of Letherhead was 216. Mrs. Leach thanks all those who took part in the collecting for this excellent result—and also for the £1 collected, mainly in coppers, for the purchase of more eggs. It is not a time, as it seems to me, for saying much. It is the critical stage of the war. We hold our breath in suspense. We are awaiting the most colossal onslaught ever delivered. Can we under God withstand it, as our soldiers quietly and firmly believe? Can we at home hold on steadily without weakness and division among ourselves? I find, for myself, no better guidance than that of President Wilson. His utterances seem to be a touchstone for enfeebling pacificism, and for a mere bluffing militarism, the two great dangers to the true and strong patriotism which we need. With unfaltering determination to use his country's power for the righteous cause, he watches quietly and steadily for any signs among our enemies of disposition for a peace which shall be real. I am glad to believe that our own statesmen are at one with him. But he gives out his meaning with telling power. I hope that you will study the matter of the League of Nations, of which the House of Bishops in the recent Convocation unanimously affirmed approval. Meanwhile for Christian people the time gives opportunity to learn more deeply and with more reality the lesson of simply dependence upon the loving Will of God, whether it be to us for victory or for adversity. And we shall learn it more, if we turn thoughts and anxieties into prayers, casting all our cares upon Him, for the nation as we might do for ourselves. If Lent, 1918, teaches us these two things of simple dependence and of corporate prayer, then it may bring us more blessing than happier times. God defend the right! and give us peace in His time. It has been decided shortly to secure for the Parish the services of a Certified Midwife who will live in Letherhead and devote her time to the nursing of Mothers and Infants in their own homes. It is hoped that she will come into residence during April. Details as to the scheme of payment will be published as soon as they are finally settled. I append some “Notes” from our Bishop which may help us in practical ways to “lift up our hearts” and keep before us a high ideal of the service due from us to God and country. March 23rd, 1918. T. F. Hobson. The speech of the Prime Minister on March 13th to the Free Churches was pitched in a fine key. He warned us of our duty “to preserve the nation from everything which is unworthy of the sacredness of our cause, and to see that the moral fibre of the nation is not undermined by drink or vice: and that the ‘flag’ which we have to ‘keep waving high' is not bedraggled in the mud, is not soiled with vengeance, greed or savagery.” All this is admirable, if deeds at all keep pace with words. “The broad question before the House is whether the education provided for the general mass of our young citizens is adequate to our needs. Let us remember what we have been asking them to do, and what we intend to ask them to do. We have been asking them to fight and work for their country; we have been asking them, not only to appreciate the forces of great political arguments and the significance of grave political emergencies, but to try to turn their appreciation of those arguments and emergencies into acts of renunciation and sacrifice. We have been asking them to die for their country, to economise for their country, to go short of food for their country, to work overtime for their country, to abandon trade union rules for their country, to be patient while towns are bombed from enemy aircraft, and while family after family is plunged into domestic sorrow. LETHERHEAD WAR HOSPITAL SUPPLY WORK-ROOMS. Tuesday, 10.30—1 and 2—6. Wednesday, 2—6. Thursday, 2—6. Gifts of money and materials are much needed; especially old linen of every description for conversion into Hospital requisites. LETHERHEAD MIDWIFERY AND MATERNITY ASSOCIATION. Nurse Mary Grist, the certificated Maternity Nurse, whose services have been secured for the Parish, will take up her work on May 2nd, and it is certain that a warm welcome will be given to her here. Her address will be c/o Mrs. Jelly, 2, Hill-top Cottages, Fairfield Road, and those who wish for her services are asked to apply to her there. 1.—Application for services of Midwife shall be made at least two months before the date she will be required. 2.—One half the fees shall be paid at time of booking, the remainder, a fortnight before the confinement. 4.—A card shall be given to the applicant upon which her payments shall be entered. This card must be sent to the Midwife by a trustworthy messenger when her services are required. 5 —The Midwife will enter the cases and the amount of any fees received by her in a book; this book shall be shown to the Superintendent at her weekly visit and the fees given to her. 6. —The Midwife shall be responsible for the care of Mother and Infant during the lying-in period, i.e., during the time of labour and for a fortnight after, or longer if necessary. 7. —The Regulations under the Midwives’ Act of 1916 are very strict, and the Midwife is obliged by law to call in a Doctor in cases where any complications occur. Should the Midwife be obliged to do so, the Doctor will take full responsibility for the case, and attend afterwards as required. In this case the Association will be responsible for the Doctor's fees. 9.—The Nurse must work in accordance with the Rules of the Central Midwives’ Board. LETHERHEAD CHURCH LADS BRIGADE AND INCORPORATED CHURCH SCOUTS' PATROL. 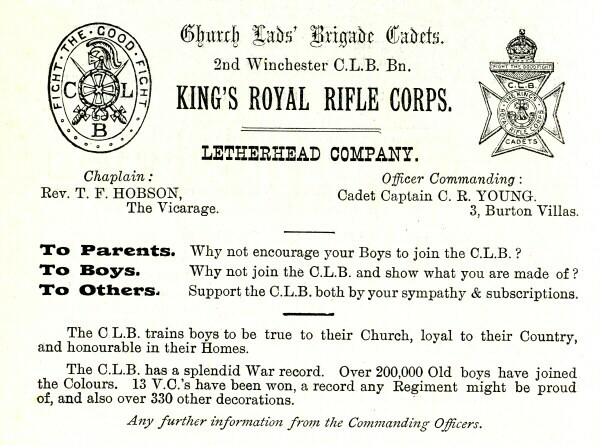 The Letherhead Company of the C.L.B. under the command of Cadet Capt. C. R. Young is going very strong. On Easter Monday, April 1st, it took part in a parade of the 2nd Winchester Battalion of the C.L.B. held by Lieut. W. A. Drury, Adjutant of the Battalion, on Bookham Common. The parade was also attended by the Aldershot, Cranleigh and Dorking companies of the Battalion. For the competition for the most efficient squad of 8 boys under an N.C.O., adjudged by a visiting officer of the regular army, our Company entered two squads, and obtained 1st and 3rd places. In the sports held after the competition, boys of the Letherhead company won 3 out of the 6 races, and also both the heavy-weight and light-weight boxing contests. During an interval the Chaplain of the Brigade, the Rev. E. Rogers, made a stirring address on the work of the Brigade, and the invaluable help which it gives to parents in training the characters of their sons during what is often a difficult period of their lives. Altogether, our Company has brought more prominently into view the fruits of the inestimable and self-sacrificing work carried on during so many years by the late Capt. Stenning, and has proved that that work is being continued and advanced in the most capable hands of its present Captain. It is hoped that the Company may be soon raised to 60 strong; as it certainly offers many inducements to the boys who join it, and to their parents to encourage them in doing so. Among all the splendid services rendered to our country by our soldiers in this War, that of old C.L.B. boys is particularly fine. The Annual Vestry Meeting was held, as usual, on the evening of Thursday in Easter Week, in the Church Room. There was an extremely small attendance. The Parish Church Accounts showed a reduction of the deficit of £67 with which the year opened by about £23. It now stands at £44 14s. 6d. The All Saints’ Church Accounts showed a balance in hand, after all debts had been paid, of £2 15s. 3d. The accounts were passed, and a voluntary rate of 2d. in the £ as in former years, was adopted. The Vicar again nominated Mr. W. R. Hewlins as his Warden, and Mr. S. Le Blanc Smith was unanimously re-elected People’s Warden for the ensuing year. The Vicar, with the approval of the Meeting, requested the existing Sidesmen to retain their office, and the usual votes of thanks to the officers of both Churches were passed with acclamation. The meeting approved of the plans and specifications for a Tablet which Mr. and Mrs. Leach desire to place in the Parish Church in memory of their son, Lt. G. de L. Leach, who gave his life in order to save those of his men in Sept., 1916. The Vicar stated that nearly 80 Letherhead men had up to that time laid down their lives for their country, and that he hoped it would soon be possible to consider what sort of memorial should be erected in their honour after the War. The work of the Church in this Parish is suffering more and more from the loss of valued helpers, whose places it seems at present difficult to fill. Yet another district, or rather group of districts, lacks a visitor through the departure of Miss I. Carpenter, whose kind-hearted, unselfish labours were so deeply appreciated by all the people in the very large district to which she has for a long time so devotedly ministered. There are now at least four districts in the upper end of the Parish and three on the Common which are in need of visitors. It is very much to be desired that, in spite of all the rules of National Service and new local special demands on the time of all our people, some ladies may feel the call to come forward and offer themselves to fill the widening breach. And if, under present conditions, sufficient sidesmen are not to be found for the requirements of either Church, may we not hope that it will be possible to follow the example of some other Parishes, and obtain sideswomen in their stead? We must expect in the immediate future, probably in the course of this month, that it will be necessary to make a considerable alteration with regard to our Services, and to some of the work carried on in the Parish; but everything is still uncertain at the time of writing, and nothing definite can be proposed as yet. May 24, 1918. T. F. Hobson. Mrs. Still will be very pleased to see all Soldiers’ Wives and Mothers on Thursday afternoons, the 20th and 27th June, and the 4th, 11th, 18th and 25th July, at Windfield, from 2 to 4.30 o’clock. Children up to 5 years old will be welcome with their mothers. On June 1st Nurse McKenna will be giving up her work in the Parish for about 4 months, while she goes through a further course of training recommended by the Queen’s Nursing Association. In her absence the work of District Nurse and Midwife will be carried on by Nurse Grist, to whom all applications in cases of illness should be made, at her address; 2, Hilltop Cottages, Fairfield Road, Letherhead. WASTE PAPER DEPOT AND BROKEN SILVER FUND. Since the collection of Waste Paper was started in January, 1917, the sum of <£155 has been realized, and sent to the Y.M.C.A. Hut Fund. With the help of the Broken Silver Fund, which has raised and contributed .£82 10s. 0d. (making a total of £237 10s. 0d.) a “Quiet Corner ” has been added to a Hut at Bouchy, France, and has been much appreciated by the men. Mrs. Thompson has been obliged to resign the Secretaryship of the Waste Paper Dept, as she has taken up other War work, and Mrs. Pollard has come forward in her place. For the future, all communications in connection with that Depot, should be addressed to Mrs. Pollard, Woodside, Highlands Road. The proceeds of both funds will be devoted to the Letherhead War Hospital Supply Work-Rooms, where expenses have enormously increased, owing to the extra work undertaken and the continual rise in price of materials. Miss Hicks and Mrs. Mitford are still glad to receive contributions of broken silver, jewellery, or oddments of every kind. LETHERHEAD WAR HOSPITAL SUPPLY WORK-ROOMS, HAWKSBURY. By special request of the Central Depot, 2, Cavendish Square, W., a thousand Carrol Pads are being made and sent to the 8th Stationary Hospital, France, every month. This will entail an outlay of about £16 a month, and contributions towards defraying this extra expense will be gratefully received. It is a hard time for us: not only because of the danger which the wonderful gallantry of our troops and sailors is holding up, so far, or because of the terrible cost in life and suffering and sorrow, but because of the wrangling and intriguing, the suspicions and discontents at home: and because of the miserable condition of Irish matters, I do feel that the heart and spirit of the nation is steadier and better than that of many of its counsellors, on one side or the other. I think we know what we are fighting for, and that, side by side with America, it will not be for aggression or selfishness, but for peace and fairness that we fight in war, and shall strive in negotiation when peace begins to dawn. The nation will neither desire nor tolerate anything else. Meanwhile, I hope that in the Church we are not merely marking time. It is quite true that there is no time for anything' that most of our best men and women are immersed in work, and doing it under heavy strains of anxiety, want of rest, diminished staffs, and the like. And, of course, it is true that we can’t get about and meet one another much: and even print and paper are scarce. Yet I think we know that through it all there is room for some things to be thought of, and some things done. (1.) Here, first, is a bit of encouragement. The national receipts of our two great Missionary Societies (S.P.G. and C.M.S.) are larger than last year, and are ‘record’ figures. It is the same with the Missionary work of the Wesleyan Methodist communion. Thank God for that and take courage: does it not show that out of the war has come some greater thought of the Kingdom of God, and that something stronger than meetings and appeals has been at work amongst us? (2.) Next, observe that the Reports of the Archbishops’ ‘National Mission—and after’ Committees have begun to appear, and within a few weeks will all be out, small, compact, cheap booklets full of matter: the result of long and anxious discussion by our best men and women. Is there not a quite clear call to us to put out a special effort of prayer and thought, of prayerful thought to meet these? They make a challenge, an appeal. They offer an opportunity of new start. But they will be mere dead stuff unless the Spirit in the life of the Church turns them into fuel and food. I appeal to the clergy to study them, to make them known, to get them upon counters and bookstalls—and (where this is done) among the religious papers near the Church doors. But I appeal, if my voice can reach, to all our lay people, men and women. Let them be read and studied, too, if I may say so, not merely to give fresh material for grumbling and complaining, and sneering at the slowness or stupidity of those in authority: but in honest, humble, practical effort to find in them what in our several ways we can help to do, or to make known and to set forward what is needed. (3.) It will go with this that we should in our parishes (even under all the present difficulties) be doing something to make our religion and life more live and more free: something which the more thoughtful of our men at the fronts are expecting of us. We want, they say, our worship simpler, sometimes shorter, in many cases more elastic and flexible: we want less formalism and more reality: more thinking (the hardest thing for English people!) about what we do in Church, and why we do it, and might do it better. We want the part of laymen and of women to be increased in our Church life (I thank God for what so many do). Within reasonable limits we may try experiments, especially in war time. I can promise that with due deference to law and loyalty I shall encourage a reasonable freedom of experiment. I have been requested by the Ruri-decanal Conference to bring to your notice the following Resolutions passed at the Winchester Diocesan Conference on April 17th and 18th. Space does not permit of any comment upon them further than that the discussions shewed that the Church in this diocese is keenly alive to the pressing problems of the time. I. THE CHURCH AND LABOUR PROBLEMS. 1. Economic methods which have resulted in semi-starvation for thousands, and a total absence of leisure and the amenities of life for many more, must be regarded as intolerable. The Church urges drastic amendment upon the principle, represented at present by the minimum wage, that the first charge upon any industry must be the well-being of those engaged in it. 2. As unemployment and casual labour are the cause of wide-spread misery, it is essential that measures to prevent these evils should be provided by means of national and local action, and by the reorganisation of industry upon a better basis. engaged in any industry should have a recognised status in the same, an equitable share in the profits produced, and a voice in determining the conditions under which the work is done. 4. As bad housing leads to moral and physical degradation it is of urgent importance that sufficient healthy dwellings at economic rents should be provided both in town and in country, and the Church presses for large and immediate action by legislation and otherwise. 5. In the highest interests of the Nation’s vigour and well-being the Church desires that opportunity should be secured by a comprehensive system of national Education, so that all, in every section of the community, may have ample facilities for self-development. 6. Since unrestricted competition is directly responsible for all kinds of waste of energy and for commercial dishonesty, degrading to character and poisonous to human fellowship, the Church will cooperate with such economic reforms as shall eliminate the excessive pressure which is thereby caused. 7. In so far as the democratic movement of our time is animated by the ideals of brotherhood and justice, and strives to procure for all a real opportunity of living a true human life, all Christians should be urged to co-operate with it and by so doing commend to the movement the spirit of our Lord Jesus Christ. II. THE CHURCH AND EDUCATION. 1. “That this Conference, representing Churchmen of the Diocese of Winchester, warmly welcomes the Education Bill No. 2 of January, 1918, and believes that it marks an important step forward in national Education. III. THE CHURCH AND MARRIAGE. 1. Believing permanent and indissoluble marriage to be one of the most precious gains and safeguards of true human life and civilization, it holds that any legislation which lowers this ideal or encourages laxer views of the obligations of the marriage bond will be perilous to the national life, and will offer uncompromising resistance to current proposals which would go far to substitute for such marriage a contract terminable almost at will by collusion of the parties, or by desertion. 2. Seeing that the Church, founding itself in this matter on the Words of the Lord, has always maintained permanent and indissoluble marriage as a trust from Him and binding on its members, it claims that in any event the Church's freedom to maintain the Christian law for its own members should be respected by the State. 3. Holding that it is the duty of the State to treat with absolute impartiality men and women, rich and poor, and to make its Courts accessible to all alike, it accepts the proposals for the amendment in these respects of the existing Statute Law which are contained in the Minority Report of the Royal Commission on Divorce. 4. “Believing that the best form of marriage defence is to develop in the minds of Christian people positive conceptions of the sacredness of marriage, this Conference urges the clergy in their pastoral ministrations to take all convenient measures to make it plain that marriage involves not only a solemn contract between husband and wife, but also a sacramental relationship." IV. THE CHURCH AND THE MAN POWER BILL. The Bishop in putting this Resolution gave expression to the feeling of the Conference by saying that as far as the Church of England is concerned we would welcome the re-instatement of the clause. I trust very much that great attention will be given to the Bishop’s Letter which is printed immediately before mine: and that all who can will get and read carefully the Report of the Archbishop’s Third Committee on the Evangelistic Work of the Church (S.P.C.K., 68, Haymarket, London, S.W.1. Price 1/-) It deeply concerns every Lay member of the Church, no less than the Clergy. The Report of the Fourth Committee, on Administrative Reform (price 6d. ), also contains much matter of the greatest importance regarding the interests of the Laity in a Parish, as well as in the Church at large. The Reports of other Committees are not yet published. Pte. Arthur George Dovey, 13th Bn. Royal Fusiliers, killed in action in France April 5th, 1918. Pte. Trayton Henry Small, 13th Bn. Royal Fusiliers, killed in action in France, April 5th, 1918. Pte. Edward George Murton, 13th Bn. Royal Fusiliers, died in hospital at Etaples, May 12th, 1918, of wounds received in action. We offer our most deep and respectful sympathy to the parents who mourn the loss of their gallant sons. The Vicar will be very grateful if the names of all Letherhead men who are prisoners of war, with a statement of their rank and regiment and the approximate date of their capture can be sent to him by Post Card or note at the Vicarage: and also the names of those who are still missing. C.E. WAIFS AND STRAYS: PAGEANT. A Pageant, to be performed entirely by residents of Letherhead and the neighbouring Parishes, will be held on Wednesday, July 3rd, in the Victoria Institute at 3 p.m. and 7 p.m., in aid of the War Emergency Fund of the Waifs’ and Strays Society, which is at the present time caring for 2000 homeless children of our Sailors and Soldiers. The Pageant is entitled “Children through the Centuries,” and in it will be presented a number of scenes, illustrative of the life and treatment of children at various periods of history, and incidentally of the character of the times in which they lived. Tickets, price (inclusive of the Entertainments’ Tax) 5/6, 3/6, 2/4 for reserved seats, 1/3 unreserved, at the afternoon performance, and 3/6 and 2/4 (reserved) 1/3 unreserved, in the evening, may be obtained from the Hon. Local Secretary Mrs. van der Swan, The Lilacs, Church Boad, Letherhead, or from Mr. W. B. Hewlins, Bridge Street, Letherhead. The Pageant has been so well received in other places, many of them much smaller than Letherhead, that we trust it will meet with great success here. The Festival will be held, by the kind permission of Mrs. Still, in the garden at Windfield, at 3 p.m. on Wednesday, July 10th. An Address will be given, and there will be a White Elephant Stall and a small miscellaneous Stall for the sale of articles in aid of the Surrey Prisoners of War Fund, and of the G.F.S. Sick Fund. Contributions to these Stalls should be sent to Mrs. Stanley Gordon Clark, Fetcham Lodge, by July 6th. As the conditions of War-time make it impossible to provide refreshments for a large gathering, members and associates are requested to bring their own Food Rations with them, as was done on the Quiet Day at Fetcham last year. Mrs. Still will be very pleased to see all Soldiers’ Wives and Mothers on Thursday afternoons, the 4th, 11th, 18th and 25th July, at Windfield, from 2 to 4.30 o’clock. The untiring efforts of Mr. Le Blanc Smith and his colleagues of the Sub-Committee of the War Savings Association resulted in a great success from the two days which constituted our “ week.” Letherhead and District, which comprised the four Parishes of Letherhead, Fetcham and Great and Little Bookham, were called upon to raise £20,000; and in spite of the difficulties entailed by exceedingly short notice, and the impossibility of providing outside attractions, such as the visit of a Tank, or an aeroplane, that sum was collected with about £600 to spare. Lord Ashcombe, the Lord Lieutenant of the County, came over on Saturday, June 22nd, and gave a stirring address to the rather small number who were present: and on the Wednesday there were exhibitions of dancing, singing and physical drill by our School Children : and an inspection of the Cadet Corps of S. John’s School. The Silver Prize Band was in attendance on both days. It is much to be hoped that the interest taken in this local effort, and the success which attended it will be an added inducement to all who can, to invest week by week, or month by month, in War Savings. It means so much, the supplying to our country of the means which she requires, and which are absolutely essential to her now if she is to be maintained in security. It means the practical realisation by every one of his or her stake in the country — for unless we win in this war there will be no longer security of life, or of any possession large or small for anyone who lives in it: and it is not the giving away of anything which we have, but the lending of our money for a time at an excellent rate of interest, in order to ensure the safety of our country, upon the soundest of all securities so long as our country is safe. If her safety is lost, then every single thing that we have will be lost with it. My first word this month must be one of grateful and affectionate loyalty. Our King and Queen keep on Saturday, the 6th, their Silver Wedding. They complete twenty-five years of wedded life. On that day and the Sunday let us have them with thankfulness in our thoughts and prayers. It is a great thing at any time for a nation to be sound at the core by the possession of a pure Court, and the wholesome example in its highest place of simple, conscientious, dutiful living. It is doubly so in a time like ours of change, and criticism, and stress. I hope the anniversary may set us thinking whether we are sufficiently mindful of the boon, and grateful for it to God Who gives it, and to those through whom we receive it. May God give them many a year yet to reign among us, under brighter skies, delivered of the King’s enemies, and in peace : and may loyalty and gratitude strike ever deeper into the hearts of their people. The thoughts of the time are overwhelming. Armageddon, indeed! the clash in deadly wrestle not of armies but of whole peoples in arms. As I write another great offensive is announced of Austrians against Italy on a front of 120 miles! And now, after delays at first, the great nation of the West throwing its manhood at an amazing rate across three thousand miles of sea ! Our hearts go out to France and Italy, mindful what we should feel if the thrust was as near to London as it is to Paris and the fair Italian cities. I need not speak to you of the terrors and anxieties, and how they should move us to fresh efforts of “man-power,” of a spiritual sort, in prayer. But for us who in Christ should be ‘sons and daughters of hope’ there must be strong hope that out of this great judgement, this mighty purging, these vast sacrifices, God will bring out things of good — perhaps the destruction of war, perhaps some new form of world-wide human fellowship, perhaps some bigger understanding of God’s purpose for humanity in Christ, and of the responsibility of men and nations to answer to that purpose and to further it, perhaps some great preparation for the coming of the King. May He keep us stedfast, and patient, and united: and put away the evil things from amongst us which, always bad, become intolerable in the solemn presence of a time like this. Miss Barnes came to Letherhead, as Headmistress of the Girls’ School in 1873, when the Rev. T. T. Griffiths was still Vicar of Letherhead, and continued that work for 36 years, until she was obliged to resign for reasons of health in 1909. Happily her resignation did not involve her departure from Letherhead, and she remained among us for the rest of her life. Of late years she had suffered much from failure of health; and during a visit to Eastbourne at Whitsuntide she became very ill and died there of meningitis on Monday, June 10th. Her body was brought back to Letherhead and laid to rest in our Churchyard on Saturday, June 15th. During her long Headmistress-ship a very large number of Letherhead girls passed through her hands. The School consistently obtained excellent reports from H.M. and the Diocesan Inspectors for the quality of the work done in it; but of still greater value was the quiet and refining influence of Miss Barnes’ character upon those who were committed to her charge and the affection and respect which it inspired on them. During the years of her retirement she continued to exercise activity for good ; and as an Associate of the Girls’ Friendly Society remained in close touch with many of her former pupils: while she was also an energetic assistant Secretary to the Missionary Association ; and undertook the management of the Nomination Coal Club for the benefit of some of her poorer neighbours. During her long residence in this place she was a permanent and steady influence for its welfare, loved by all who knew her, and a shining example of the Christian life. — R.I.P. “ Blessed are the dead that die in the Lord.”—Rev. xiv. 13. July 15. Ernest Victor Coward, aged 11 years. July 22. Ada Elizabeth Weller, aged 32 years. The month brings with it the beginning of another— the fifth — year of the war. No word of mine is needed, I am sure, to ask you to keep the first day of the Fifth Year, which falls on a Sunday, with reverence and godly fear, with thankfulness for Divine blessings, and for human performance and patience in an unexampled ordeal. We shall remember our living and our dead: our living still bearing in trenches, or afloat, in stress of battle, and in strain of waiting, in bodily sufferings, and in the bitterness of captivity, things of which we at home can form the slenderest and most superficial idea: and our dead, dear to us for their love and for what we knew and had in them: or, if unknown to us, ennobled in our thoughts by their sacrifice, and the cause for which they gave their lives. And as we offer, childlike, these prayers to our Heavenly Father, the Father of our Lord Jesus Christ, we shall look forward with manful hearts to the future, the near but unknown future, full of dangers, full of fears, but full of opportunities, and therefore of hopes. We shall pray for a righteous judgement of God upon all the crafts and cruelties of our enemies : we shall pray for the forgiveness and the purging of all our own national and personal faults. We shall pray with all our hearts for peace, a true peace, a righteous and lasting peace, which shall be a blessing to all the nations, and prepare the way for the world-wide Kingdom of our Lord. I do ask you not to fail in this on August 4th and otherwise, clergy leading their people, people encouraging and even stirring their clergy. I have spoken of the future, and all that it may contain. This brings me to another most weighty matter on which I want to be allowed to lead you. The War is a happening so tremendous that the roar and rush seem almost to forbid other thoughts. Yet there are other happenings which are in their bearing on the future hardly less important and even colossal. Such a happening is the gift of the vote to a number of at least eight million new voters: two millions more of men, and six millions of women. This is an enormous difference in mere numbers; but the difference made by the inclusion of women along with men is a difference not in numbers only, but in kind. Personally I welcome both changes. No thinking person can doubt the dangers of these huge electorates: and time only can show how women will use their power and what the effect on their lives will be. But I rejoice that we live in a time when by spread of education it is possible for every man to be a citizen, helping to make as well as to obey the law, honoured with the trust of a share in shaping his country’s course. And, though I was slowly converted to a change which brings women out into the bustle and fray of politics, I unfeignedly rejoice that by giving them the vote the Nation publicly and for ever repudiates the notion of the inferiority of women to men, a notion which no thinking Christian could ever accept. But what I think or anyone thinks on these changes is not to the point. The point is that they have been made: that they are enormous in size and in effects. Whether or no we wished more men to be enfranchised, whether or no we desired votes for women, we ought surely with one heart to accept the decision (made not by party victory, but by agreement). We ought to open our arms wide to admit into the constitution and into comradeship these new fellow citizens in full right, both men and women. We ought to give them hearty greeting. We ought to pray with them and for them that they may learn and realize their responsibilities, and rightly and wisely exercise their power. I am very glad to have had a share in the decision that we Bishops should call the whole Church and Christian people to lively understanding and open recognition of this matter and of all its importance. And because I think that a thing of this kind needs some public and united expression, I suggest that in every parish we be invited on one particular Sunday (I think October 4th will in most places be best) to bring the matter in Sacrament and Prayer before God, asking for the newly enfranchised a full sense of their responsibility with wisdom and uprightness in the use of the vote; and for our country, happy results of progress, power, and peace. If this is to be heartily done, all political partisanship and controversy must be severely kept out of the words spoken and the forms used. I hope that the day chosen may fall at a time when the matter is coming more and more into people’s thoughts, and yet be before all the excitement and contention of a General Election come on. Fourth Anniversary of the Declaration of War. The Services, at the usual hours, will be special Services of Prayer and Thanksgiving and the collections will be given to the Fund which is being raised in Letherhead on behalf of the East and West Surrey Prisoners of War Fund. On Wednesday, July 3rd, in the Victoria Hall, a most successful Pageant, called “Children throughout the Ages,” was held in aid of the Special Emergency Fund of the Waifs and Strays Society, which provides for the maintenance of the homeless children of our soldiers and sailors. “ Bethlehem,” arranged by Miss Tullis, Letherhead Court. “The Little Waif,” arranged by Miss Aldridge, Poplar Rd. School. “S. Gregory,” arranged by Miss Tullis. “The Church receiving her children,” arranged by Mrs. S. Gordon Clark and Mrs. Guise. “ he Dame School,” arranged by Miss Aldridge and Miss Chamberlain. “King Charles bidding farewell to his children,” arranged by Miss Aldridge. “The Children of the Empire and the Allies,” arranged by Miss Aldridge. Unfortunately, owing to infectious illness, several other scenes had at the last minute to be given up and their places filled with music. The hall was well filled for both performances, and the result was a sum of £70, which has been very gratefully accepted by Prebendary G. M. Rudolf, founder of the Waifs and Strays Society. Many thanks are due to Mrs. van der Swan, local secretary for the Society, for her untiring efforts to make the Pageant a success, and to those who worked so hard in the production of the scenes, and to the ladies of the orchestra under Miss Owtram; and to the Rev. E. Lumley and Mr. Carlile for their valuable help with the staging of the scenes. The Annual G.F.S. Summer Festival was held on Wednesday, July 10th. Mrs. Still had kindly offered the use of her garden at Windfield, but the day proved so showery that refuge had to be taken in the Institute. Two well-covered stalls had been provided by Members and Associates, and a Sale was held, the proceeds being divided between the Brabazon Home of Rest at Reigate and the fund for the Surrey Prisoners of War. An excellent address on the opportunities for good provided by the G.F.S. was given by Miss Gillespy, followed by a few words from Mrs. Stanley Gordon Clark, our Branch Secretary, on the wonderful amount of War work which is being done by members of the Society, with special mention of the high respect felt and shown by the Government for its organization and thoroughness. She also spoke of the loss the Branch had sustained through the recent death of Miss Emma Barnes, who had for many years been an Associate. After tea there was a short programme of music and games, which ended a very pleasant afternoon. Every one in Letherhead will deeply regret that considerations of health have obliged Miss Scott to resign the Headmistress-ship of this School. A gathering of friends and parents was held at the School on the afternoon of Wednesday, July 24th, for the purpose of testifying to the esteem and affection with which Miss Scott is regarded in Letherhead, and our sorrow at her departure from among us. The Vicar spoke most warmly of the excellence of the work which Miss Scott has carried on at All Saints’ School during the last 12 years: and mentioned the high praise which all Inspectors, without exception, had bestowed upon it: and after wishing Miss Scott a speedy restoration to health after complete rest, and a happy return to school life again, presented Miss Scott with a carriage clock and silver mounted biscuit-box, on behalf of the friends who had united in giving this token of their esteem and regard. The Managers have appointed Mrs. Ratcliffe, at present teaching in Coulsdon Schools, as Miss Scott’s successor. THE DAILY CALL TO PRAYER AT NOON. The Church Bell has been rung daily at 12 o’clock since October, 1914, in order to remind us to say a short prayer on behalf of the sailors and soldiers who are fighting for their country, and risking their lives in order that we may live. Unfortunately the bell is not heard at any distance from the Church owing to the lie of the land; and there is some reason to fear that many who, whether they heard it or not began the good practice of noon-tide prayer have failed to keep it up. We should do well to follow the custom which was at one time observed in some places in England, and which we are told has been very generally adopted in America of stopping all business or other occupations where-ever we are for a few moments with this object. An example of the kind of prayer which may be used in silence, under all circumstances, whether standing, sitting, or walking, is appended. “O God we pray Thee, support and protect our sailors, soldiers, and airmen ; give comfort and relief to the Wounded and the sick, the prisoners, the anxious, and the mourners ; grant victory to our arms; and bring the war to an end in a just and lasting peace : through Jesus Christ our Lord.” Amen. The Meritorious Service Medal has been awarded to Sergt. T. Roberts, R.E. (Labour Battn.) for gallantry in keeping his men together at work under heavy fire from the enemy. Mr. Skene is one of the Chaplains at a great Camp at Cherbourg, and there is some possibility of his being sent to Egypt before long. Mr. Sharp, after some weeks in the Camp at Catterick Bridge, Yorkshire, crossed to France about a month ago. Since he left us it has been possible, with such help as Mr. Maurice is able to give us on Sundays, to keep on our Services as usual, thanks to the very great assistance which the Rev. H. G. Jameson, and our Lay Readers Messrs. Le Blanc Smith and Cogman so unsparingly give to us. The Parish owes a very deep debt of gratitude to them : and will also recognize that it may at any time become necessary to diminish the number of Services in either Church at quite short notice. We have reason to be thankful, that so far we have not been forced to bear our share of the “ going without ” entailed by the war in that particular way as so many other Parishes have to do. Some two months ago the small clock which stood on the mantelpiece in the Vestry of the Parish Church mysteriously disappeared, and has not, so far, been returned by the person who “borrowed” it. A certain amount of inconvenience is caused by the lack of a Vestry Clock: and perhaps one of our Parishioners may feel moved to provide a successor to the one which we have lost. We regret to state that at about the same time the box containing the offerings made at “Churchings” in All Saints’ Church was broken into, and its contents stolen. Several months ago a determined, but fortunately unsuccessful, attempt was made to break open the pillar alms box in the Parish Church. We began the month of August with solemn acts of Prayer and Thanksgiving. What fresh reasons for thankfulness the month has brought us! The turn of the tide abroad, on the French front: and at home the splendour of the harvest, favoured by this August’s glorious sunshine. I hope and think that in all parishes our Harvest Services will have a special emphasis and sincerity. But, with Prayer and Thanksgiving, there was another thought in our hearts on the Anniversary. It was that of committal — shall we say dedication, national dedication — to a great, urgent, noble cause, to which we put our hands in 1914 and which we are pledged to carry through. Dedication —That is the word on which I ask you to dwell this month. The meaning of it begins in noble examples in the ghastly warfare, but it goes up to the throne of God. Neither man nor nation have a right to dedicate themselves to anything but what they believe to be the Divine will and call for them. This is what we believe about our cause. It is good: and we must, with all our power, keep it good and not let it be adulterated with the meaner things of revenge or self-seeking. But dedication means more than this. It means not only that the cause is good, but that the champion is worthy. A dedicated nature will feel the demand upon it to be worthy of the call to fight for the right. An illustration comes before my mind. I think of the youth called in old days to Knighthood. For him that was a dedication of his manhood to serve the right. And we read how the candidate was wont to prepare himself: the ceremonies of the bath, the white garment, the act of penitence and confession, the sword laid before the altar, the night of vigil and prayer. There is an ideal of dedication. Its form is mediaeval. Ought it not in substance to be ours as a nation, and as individuals who do each their little part in the nation’s great service? A knightly or chivalrous spirit, clean and modest, disciplined and unselfish. Doubtless there were many unworthy knights: who thought that dash and fighting and swagger were all that knighthood meant, and that foul talking and loose living were all part of the life. But, all the same, knighthood stood for what was bravest and best, for self respect, for care of the weak and reverence for women : and there were very gallant gentlemen who bore the name. That, I think, will give us something to think about. A knightly or dedicated nation pledged to serve the right. Will it not be a nation whose sense of right in all matters grows quicker and keener? Which grows more sensitive to the wrongs in its life, more eager to live up to its true character? That is what we should keep before us. I think we ought to be able to create some thought of it in the children, and in those a little older—the lads and all the vast numbers of girls. (The young men are for the time away from us). Discipline will do something for many : but far more potent, if it may be, will be the appeal to them for self-discipline and to their own sense of what is really worthy of English men and women in the coming days. It is this desire that our country should be worthy of itself and its calling which made us anxious about the Lotteries Bill — with its lowering of our well-understood national standard in the matter of gambling — or about any attempt by DORA or in Army discipline to old, discredited methods of dealing with vice; and it prompts an even greater anxiety about proposals to exchange Christian marriage for a dissoluble contract. But, besides these more public matters, we all of us — citizens and Christians, clergy and lay people — should keep thinking, thinking, whether we are doing our best to make the spirit of our English life more worthy of our “high calling.” Dedication to the enterprise of war will have its natural ending sooner or later: pray God it may be “sooner ”: but a nation tested, disciplined, preserved, and blessed as England will be if she really comes safe and successful out of this war, will be called as perhaps no nation has ever been to dedication — if she is to make her home life what it ought to be, in secured welfare and in openness of opportunity for all conditions of men and women within her; and if she is to stand for what she ought to stand for, as being (with America) the leading Christian country of the world in her dealings with backward and dependent races, and in her discharge of her trust for the Gospel, for world evangelization, which the position implies. These are very slight words on a very great subject. But I am sure that the thought is one which I ought to give you. * If what I have written should, by God’s blessing, lead some all over the Diocese to think over it and pray over it—singly or in conference—they would find in it far more meaning than my words are at all sufficient to suggest: they will be surprised themselves, and they will be doing something most real for the future of our Church and nation. *One application of the thought, of pressing and immediate importance, is that study of the National Mission Reports, of which it has been said that “ The value of the National Mission, and much more the seriousness of our corporate self-examination, will be judged by the study given to these Reports and the response they meet with.” I do most earnestly urge the duty of this study, undertaken in a practical spirit. It is with the greatest regret that we record that Capt. C. R. Young has been ordered by his medical adviser to give up all work and leave Letherhead for three or four months. During his absence Lieut. Drury, the Adjutant of the Battalion of this district has very kindly undertaken to carry on the command of the Letherhead Company of C.L.B., and Sergt. Clark to be responsible for the Scouts’ Patrol. On the last Sunday in July, a presentation was made to Capt. Young by the members of the Brigade, and by the non-commissioned officers, in token of their appreciation of the untiring labours with which he has so successfully maintained the life and vigour of the C.L.B. and I.C.S.P. in this place: and we have the sincerest hopes that complete recovery of health may restore him to his life and work ajnong us by the beginning of next year. The Distinguished Flying Cross has been awarded to Capt. Maurice Le Blanc Smith, of whom it is recorded in the Times of Aug. 5th that he is “ a very efficient officer and successful patrol leader, who during the “recent operations has done great execution in attacking general targets.“ On a recent occasion, he attacked five enemy aeroplanes, destroying one “and driving down another out of control.” At a later date he brought down three German aeroplanes within our lines in one day : and he has since been promoted to be Major and Squadron Commander. The Military Medal has been awarded to Gunner Percy D. Green, P. Battery, R.H.A., for conveying important despatches under heavy shell fire. We have the great happiness of recording that Pte. Arthur George Dovey, who was some months ago reported to have been killed in action, is alive, though a prisoner in German hands. The death of Mr. William Henry Brown at the early age of 54, has removed from our midst one of the best known and most respected inhabitants of Letherhead, who was most closely identified with the life and growth of the place, and was the largest employer of labour in it. He had greatly developed the business which he inherited from his father and grandfather: and a very considerable amount of the buildings erected in Letherhead during recent years was carried out by his firm. He was a devoted Churchman, and, until his health completely broke down, a regular worshipper at the Parish Church : and took the keenest interest in everything, great or small, connected with it and with all the organizations of which it is the centre : never grudging any amount of time and trouble if he could do anything for the well-being of Church life in the place. He had been for some time one of the Representatives of our Parish at the Ruri-decanal Conference. A man of the most generous, warmhearted, and kindly character, he will long be sorely missed by the many friends who regarded him with affection and esteem.—R.I.P. Mr. & Mrs. William Collyer, of Barnet Wood Lane, wish to thank all friends who kindly sent to them in their sad loss. Mr. & Mrs. Bowman, of 21, Kings Lea, desire to thank all friends round Letherhead who sent letters of sympathy to them at the time of their daughter’s death. The Harvest Thanksgiving will be held on Sunday, Oct. 13th. The preachers at Evensong (6.30 p.m.) will be — in the Parish Church the Rev. W. H. Turnbull, S.C.F., Senior Chaplain at Horton War Hospital — in All Saints’ Church the Rev. H. G. Jameson. Gifts of fruit and vegetables will be very gratefully received; and should be sent to the vestry of either Church before 10 a.m. on Saturday, Oct. 12th. It is hoped it may be possible to send these to the Fleet, through the Vegetable Products Committee for Naval Supply. It is also hoped that the allotment holders in the Parish will attend the Evening Services for the purpose of making a united act of thanksgiving for God’s blessing on their special efforts. The Collections on the day will be given to the Fund for the Spiritual needs of the Parish. Under present circumstances the Assistant Clergy Fund, to which they are usually given, does not require them this year: and the Vicar is endeavouring to secure a paid Lady Worker whose help may be able, in some respects, to supply the deficiency caused by the absence of both our Assistant-Curates. CHURCH LADS’ BRIGADE AND SCOUTS’ PATROL. We have the good news that Cadet-Capt. C. R. Young has greatly benefited in health by his enforced rest and that we may look to have him back amongst us earlier than we had ventured to hope. Meanwhile the work of his post is being most energetically carried on by Cadet-Capt. W. A. Drury, in addition to his labours as Adjutant of the whole Battalion of the Letherhead District of C.L.B. ; and by the time that this appears in print, an entertainment will have been given, which will we trust proved to have been entirely successful in increasing the financial support, which is absolutely necessary for the adequate maintenance of the Brigade and Patrol in this place. LETHERHEAD WAR HOSPITAL SUPPLY WORK-ROOMS, HAWKSBURY. Change of Time. On and after Tuesday, Oct. 1st, the hours of work will be from 10 a.m. till dusk every Tuesday, Wednesday and Thursday. Workers are invited to bring their lunch. Ethel Dean, aged 10, of Waterloo Place, Church Walk, and Mary Wyithe, of Langley Terrace, Kingston Road, who have attended the above School for the last three years, have gained Free Scholarships at the High School for Girls, Dorking. Last year Freda Gardiner, aged 11, of Barnett Wood Lane, also obtained a similar Scholarship from the same School. These Scholarships, which provide free “secondary” education for three years, are limited in number, and are open to competition by candidates from Elementary Schools over a very wide district. The successes of our Poplar Road School in two successive years is evidence of the quality both of the successful scholars and of the teaching given in the school. The Editor apologises profusely for the late appearance of this number. He has no excuse to offer but that — always a lame one — of a combination of adverse circumstances. Capt. Claude Leach, 4th Bn. Rifle Brigade, has been awarded the Medal of the Order of St. Saviour and the Redeemer by H.M. the King of the Hellenes. Private Percy Friday, East Surrey Regt. Gunner Percy D. Creen, P Battery, R.H.A. Sergt. John Walker, Royal Fusiliers. Lce.-Cpl. H. T. Kelly, East Surrey Regt. killed in action in France. On Friday, Nov. 8th, at 2.30 p.m., a great Public Meeting will be held in the Borough Hall, Guildford, of Clergy and Laity of the four Rural Deaneries of Guildford, Dorking, Letherhead and Godaiming, in support of the Enabling Bill which it is proposed to introduce into Parliament early next year with the object of restoring to the Church the same right to regulate her own affairs as is enjoyed by every other religious or secular organization in the land. The meeting will be addressed by Viscount Wolmer, M.P. ; the Rev. J. G. McCormick, Vicar of St. Michael’s, Chester Square, London; and H. E. Kemp, Esq., of the Church of England Men’s Society. The movement which this meeting is intended to promote aims at giving to the Laity a more active share, and therefore, naturally, a greater interest, in the management of Church affairs: and the Vicar hopes that a large contingent of Churchmen and Churchwomen from Letherhead will make an effort to attend the meeting and witness by their presence there to the real interest which all must feel in a definite and reasoned attempt to increase the power of the Church for good throughout the land. The provisions of the proposed Enabling Bill are sketched in the Report of the Archbishops’ Committee on Church and State, price 6d., which may be procured from the Society for Promoting Christian Knowledge, 68, Hay market, London, S.W. 1. This was observed on Sunday, October 13th. The Churches were beautifully adorned by several ladies; to whom we are most grateful for the time and labour which they bestowed at a period of very heavy pressure, as well as to all the givers of flowers, fruit, vegetables, &c. The vegetables were sent off next day, through the agency of the Vegetable Products Committee, to the Grand Fleet; and we were duly informed of their safe arrival at Aberdeen, whither the authorities had requested us to send them. We have to thank Mr. Lack for the loan of a number of crates, and for their transport to the station: and Mr. Jenden for the gift of boxes and for his kindness in packing the whole: and also the officials of the L. & S.W.R. for their ready assistance in despatching our contribution to the needs of our men at sea. On Oct. 2nd a very successful concert in aid of the funds of the Brigade was held in the Victoria Hall; to which was added a drill and gymnastic display by the Letherhead and Dorking Companies of C.L.B. and a dramatic sketch performed by members of the Letherhead Company. The prizes were presented by Mrs. Still: and a sale was held of articles which had been given for the purpose. About £20 was realised by the entertainment. The Anniversary Service will be at Evensong in the Parish Church, 6.30 p.m., on Sunday, November 10th, when the Sermon will be preached by the Rev. W. F. Leadbitter, Asst.-Curate of Christ Church, East Greenwich, and Regimental Staff Officer of the Southwark Regiment of C.L.B. The collection will be for the C.L.B. and I.C.S.P. The Vicar has not yet been able to secure the much-needed assistance of a trained Lady-Worker, to which object the collections are to be applied, but the Bishop holds out hopes that one may shortly be forthcoming. We are asked to state that the Church Army’s Annual Sale of Work will be held in the Central Hall, Westminster, near the Abbey, on Nov. 26th (from 2.30 to 7.30) and 27th (from 11 to 6) and that H.R.H. Princess Patricia of Connaught hopes to open this Sale on the 26th. The Church Army, in addition to its ordinary work, provides 800 Recreation Huts or Tents for our men on service (100 more were lost in the German advance last Spring): besides Kitchen Cars at the Front, Hostels in England for men on leave, for discharged men learning trades, for munition workers, and for wives of Service Men, and Homes for the motherless children of sailors and soldiers. All this most necessary assistance to the welfare and comfort of those who are fighting for our country and their dependants costs a very large sum of money which has to be raised from those of us at home for whose protection our men are engaged in warfare, and who cannot but appreciate all efforts made in their behalf. It also demands a large number of workers and, therefore, I am asked to make known the great need of additional workers, both men and women. Adequate allowances are made when needed and married workers are insured against death or injury. Enquiries and offers of service are welcomed by Prebendary Carlile, 55, Bayswater Street, London, W. 1. In the four dark and anxious years which we have gone through together I have written to you so often in words upon which the darkness of the time threw its. shadow, that now, when in God’s mercy the tide has turned, and the air is bright with hope, I must share the happiness with you. Now at last we believe the enemy’s attack is being rolled back from the fair lands of France and Belgium, which they have so foully and cruelly devastated. Never again, we trust, will they recover strength for new invasion or to threaten our own shores. The nightmare is passing at last. Let our hearts sing with joyfulness. It must indeed be joy chastened by the fresh and fresh reminders that the wonderful fighting and the great advances mean a constant toll of sorrow to fresh homes in France and all the English-speaking lauds, a constant lengthening of the Roll of Honour and of the lists of the maimed. But even that cannot take away the joy in which ‘ we are,’ indeed, ‘ like unto them that dream,’ so great and swift and overwhelming is the change. Joy and gratitude! Gratitude for our men’s most noble courage, for the nation’s stedfastness, for the help from overseas, for the unity of the powers leagued together for liberty and justice. And gratitude must go up in thankfulness. The ups and downs of the war, the narrow escapes from disaster, the fall and rising of States, have taught us how little the calculations of human ambition, or strategy, or diplomacy, avail to secure results. To Him Who has the nation in His Hand, and works by the slow action of moral forces, let us give uplifted and humble thanks. Let this be a marked part now of our intercession services. And with even quickened seriousness of thought and prayer let us look forward to that most anxious, if hopeful, time which will assuredly follow the war. Of that I do not speak to-day. But there is one word which, as your Bishop, I ought to say. Let us be careful of our own temper and that of the nation in the hour of success. There is such a thing as the intoxication of victory. Like good wine, indulged without restraint, it may go to the head, and overset the balance. But there is a great danger, for poison works in our system, the poison of the brutal cruelties, and the evil devices and excesses of the enemy. The time of making peace, and of dictating terms, will be morally an anxious one. Much we must leave to our leaders. They will have us behind them in firmness which completes the overthrow of the military machine, and of the system which has worked it. It would have been simple folly (for example) to grant an armistice just when it might prevent decisive overthrow. We must have security, too, for the future: and we can hardly ask too much compensation for ruined towns and trampled countries. Justice must be firmly and sternly served. But keep in mind, I pray you, that revenge is one of the great passions and temptations of the human heart: all the stronger because, like other great temptations, it blends with fine and generous feelings, and plies them to its service. There is nothing against which the spirit that is of Christ more directly pleads and strives. If we are aware of it, if we are on our guard against it, it will lose half its power. Forewarned, forearmed. But I beg you, as you listen to unguarded talk, as you read what men write in newspapers, watch, keep steady, test, and pray for a right judgement in yourselves, in each of us, and in the nation. Piteous, indeed, if in conquering the Germans we should let the evil spirit, whose power over them we have watched with horror, conquer ourselves. Cpl. Leonard James Faithful, Royal Fusiliers, killed in action Aug, 27, 1918. Pte. Herbert Tribe, Shropshire Light Infantry, killed in action Sept. 7, 1918. Cpl. Wilfred Randall, Royal Fusiliers, died of wounds received in action Sept. 30, 1918. “ Blessed are the dead that die in the Lord.”— Rev. xiv. 13. Oct. 31. Charles Henry Paris, aged 46 years. Nov. 1. Frank Henry Holland, aged 30 years. Nov. 2. Ernest Frank Wright, aged 26 years. Nov. 6. Sarah Cox, aged 66 years. Nov. 7. Sarah Jones, aged 75 years. Nov. 8. Ellen Florence Skinner, aged 18 years. Nov. 9. George William Christopher Alexander, aged 26 years. Nov. 9. Harriett Self, aged 78 years. Nov. 11. Thomas Hooper, aged 71 years. Nov. 12. Violet May Songhurst, aged 16 years. Nov. 13. Winifred Ethel Long, aged 9 years. Nov. 16. John Dixon, aged 60 years. Nov. 21. Dorothy Amelia Edwards, aged 16 years. Nov. 25. Maria Cheesman, aged 81 years. Gladness deep, joyous, solemn, is in all our hearts. We enjoy, and shall enjoy, the removal one by one, and little by little, of restrictions, patiently borne but not a little irksome, and the coming back one, by one of little conveniences, and opportunities, and interests, and enjoyments. But the gladness is a great deal deeper down than all this. It is the gladness of relief from menace of danger, from the dread of the daily entries on the Roll of Honour, from the threat to our very life and freedom as a nation, from a darkness which overhung the life and future of the world, from a triumph of the Wrong. Such gladness nothing can impair: but with it there blend in solemn unison the memories of those who do not.share it with us here, but won it for us by their bravery and their deaths. Their sacrifices find a new glory in the light of victory. It is comfort of the best sort that those sacrifices were not offered in vain. They give back to victory what they borrow from it, of lofty and solemn meaning. Benediction has come to us through them. It has been an added happiness that the nation has received so finely the great gift, with great gladness but soberly and in the fear of God. The ever memorable adjournment of the Houses of Parliament in order to cross over to S. Margaret’s, and the King and Queen’s impromptu visit to S. Paul’s Cathedral, were but the expression in the highest places of what crammed our own great Cathedral and the Churches everywhere with the crowds who felt by a common instinct that joy can only speak with its fullest voice in praise to God. Victory, like War, has taught us out of our own hearts its lesson of faith, and instance after instance comes to us of the way in which this has found spontaneous expression from multitudes and from individuals. We have hardly yet taken breath, and it is an effort to look forward. But we cannot begin too soon. Nor are we likely to do so in the month which is to see elected the first Parliament of Reconstruction. Words of mine may have already reached you through the Press, in which I tried to express to the vast new electorate, both of men and women, the welcome and respect which (whatever our opinions may have been) we can unite to give them. So also all can unite to send their representatives to the new Parliament impressed with the sense that the nation expects them to give themselves with directness and energy to making England a better place for all its people, especially its children, its workers, and its poor: and to using for the world’s good all the new power which victory gives. Let me ask you all to keep these things in your prayers, personal and united. I would strongly advise that we do not simply drop off our special prayers of war time “like weary men whose task is done,” but in some way as parsons and people find how best to turn them into peace prayers. Let such prayers be public-spirited. Pray for the nation a God-fearing spirit, and one of soberness and unity. Pray that we ‘fall not out by the way’: and that the land sheltered from the enemy may be kept from all strife and violence within. Pray that a double portion of the spirit of wisdom and understanding be given to those who rule and guide. Meanwhile we all have our tasks of duty and repair. Remember that the time of the return home of our men already begun, will now be fully come. How shall ive receive them? God forbid that it should be with temptations to folly and sin. A great responsibility is upon the women of the nation in this matter. But let us try to make life brighter and better for them. And think especially of the reception by the Church in the parishes of their returning soldiers. I do trust that clergy and people will be giving their mind to this matter. Will the services be shorter (the Archbishop’s Committee on worship advises ‘one hour, or at most an hour and a quarter’), more flexible, more suited to them: more like what in war-time they have been found by Chaplains to need and appreciate. Of course we have the whole congregation to consider, but it is these men who deserve most consideration, and I shall be surprised if what suits them does not really suit most of us. I am sure the clergy in their sermons should — not indeed be always speaking to them, but should have in mind what we have learnt about their thoughts, and difficulties, and needs. But it is not only in the Church that we have to meet them. Let none of them have to complain that when he got home at last no one in the Church seemed to care. The clergy will try, I hope, to call at every house when husband or son comes back: chat over his experience: and be ready to meet any sign that he is ready to take his place in Christian life in Church and out of it. In larger places (perhaps in all) -some of the people may share this with the parson, though always showing that they come in the Church’s name. Is it again a time when some habit of family prayer may be started again ? Perhaps something like Robert Burns’ “Saturday night”? There is neither time, nor space, for me to add much to the Bishop’s letter, but I desire very much to say two things. (1) About the Election. It is very much to be hoped that all Electors, on recording their votes, will consider the welfare of this country as a whole, which includes, the interests of all classes in it: and not confine their views to the aims of one class only, no matter how excellent in themselves those aims may be: and that they will vote for the man, whether he belong to the Conservative, or Liberal, or Labour party, who, so far as they can judge, is most likely to devote himself to promoting the well-being of the whole Nation and Empire. There is a danger of overlooking this, in pressing the urgent and most legitimate claims of one or other class within the nation, to the exclusion of the rest. Just as we have sunk our individual interests in order that the country, as a whole might prove victorious in tthe jwar : so, surely, ought we now to sink all considerations of party or class, and join together in a whole-hearted effort to place in power a really strong Government, which, fortified by our goodwill behind it, can act freely in the best interests of us all. (2) About a War-memorial. People are, of course, talking about what we are going to do here. In the first place something should be chosen which will appeal to the hearts of every one, without exception, in the place. Secondly, whatever else is done, the names of those who have given their lives for the great cause should be recorded, for future generations to read, in the Parish Church, which for at least eight centuries has stood, altered in no vital point, in a place where all else has experienced infinite vicissitudes of change and decay. And whatever is done, we should in some way mark the sacredness of the cause in which we have been engaged, the cause of our Lord and Master, Christ against the powers of evil. I hope, myself that it may be possible to erect a Cross; bearing His figure upon it, on some spot in the Churchyard, in token that our hope is in Him, and that, following His example, the nation dedicated itself to sacrifice and suffering in His Cause, and that all who live in this place are bound to maintain that Cause even to the death. Advent, the season of the Coming of Christ, is upon us; may we find in the renewed and quickened life of Church and Nation and all its members that He is come to us indeed more fully than heretofore. Extract from Report for the year Oct. 1, 1917, to Sept. 30, 1918. The Band has turned out on 30 occasions, including marches with the 10th V.B. Surrey Regt., War Weapons Week, British Red Cross Society’s Entertainments, Red House Hospital Fête. The Band was engaged on every Wednesday during the Summer, of which only four were free for Promenade Concerts, These, however, were exceedingly successful. Fourteen members having joined the Forces, it was necessary to obtain outside assistance at heavy expense; but it is hoped with the return of peace to bring the Band again to its former strength. The Band tenders its most hearty thanks to all Subscribers and Donors for their kind support. The Military Cross has been awarded to Lieut. (Acting Capt.) Vivian St. Clare Hill, 32nd Bn. Machine Gun Corps. The Military Medal has been awarded to Sergt. Walter Mills, Canadian Contingent. We very much regret that through an unfortunate' accident this was not recorded in the October Magazine. Pte. Frank John Filkins, Lancashire Fusiliers, killed in action, Oct. 12, 1918. Pte. Harold Hawkins, Machine Gun Corps (formerly 2/4 Bn. Royal Queen’s West Surrey Regt. ), killed in action, Oct. 13, 1918. Sapper Frederick Joseph Blackwall, 50th R.E., died in hospital in Germany, Oct. 9, 1918. Pte. Albert James Fairs, A.S.C., M.T., died of pneumonia at Salonica, Oct. 20, 1918. Cpl. Leonard Charles Gibbs, 85th Bn. Canadian Contingent, died of wounds received in action, Oct. 27, 1918. Lce. Cpl. Ronald Percival Tribe, 1st Bn. Queen’s Royal West Surrey Regt, died of wounds received in action, Oct. 30, 1918. Pte. Frederick Watkins, 20th Hussars, killed near Mons, Nov. 7,1918. Private Watkins went out with the first Six Divisions in August, 1914, and took part in the retreat from Mons. Having served through the whole war, he was, by a tragic fall, killed only four days before the end of active hostilities in the same region as that in which the British Army entered upon them. In the long list of burials at the Parish Church last month will be found the names of George Alexander and Ernest Wright. Both had been wounded in the war, and returned, after their discharge, to live at home. But their health had been shattered, and proved unable to resist the attack of pneumonia following influenza; and their lives were no less certainly sacrificed to the service of their Country than if they had fallen in action. Mrs. Fairs, of Rivers Cottages, Kingston Road, desires to thank her friends for the sympathy shewn on the death of her son on active service at Salonica. Mr. and Mrs. Songhurst, of Railway Cottages, Kingston Road, desires to thank all friends for their kind sympathy in the sad loss of their daughter; and also for their enquiries after other members of the family.